The activities of “The Chocolate way” are inspired and are implemented in accordance with the Resolution CM/Res (2013)67 adopted by the Committee of Ministers of the Council of Europe. The promotion of the officially recognized cultural route dedicated to chocolate. The ”Cultural Route” entitled La Via del Cioccolato is “The Chocolate Way”. The management and development of the route immediately following official recognition of said Cultural Route and upon acceptance of legal status according to Italian Presidential Decree 10 February 2000 no. 361. The promotion, enhancement and protection of centuries of European artistic, historic, cultural heritage, linked to cocoa and chocolate. 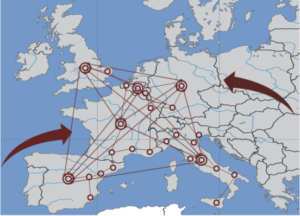 The expansion of its visibility by putting Chocolate Routes in a network, highlighting both the role that chocolate has had over the centuries and its present role fostering communication between European populations and distant cultures, even overseas, bringing them closer through trade. Promotion and production of artisan made chocolate as a symbol of European identity, through the diffusion of craft knowledge and of traditional techniques. Through this we promote the construction of a common European citizenship and generally contribute to improved exposure of the European image and cultural identity. Enhance and promote the artisan confectionery product, in particular, chocolate, as part of a healthy diet with a high nutritional value. Promote and support projects of the cocoa origin countries to assure a better tenability of all the chocolate supply chain.